A majority of the public aren't aware of the details of the Regina Highway #1 Bypass being built near Tower Road within City Limits. 99% of the public strongly disagree with the Regina Bypass being built within City Limits, which will only divert a fraction on the truck traffic South. Without a north route, most of the truck traffic will still have to come into the city via Victoria Avenue to Ring Road to go north to the truck terminals, warehouses, dealers, services, and highways North. Why would you build a Bypass within Regina city limits with high speed curves over railroad tracks, that can only go south, not north, that according to a Highways Engineer will reroute only 10% of the truck traffic? An engineer who worked on the Highway #1 stantec study in 2004 said Tower Road and Gravel Pit Road were equally weighed for the Regina Highway #1 Bypass, based on the parameters that it would take 25-30 years for development to get to Tower road. Now within 10 years they are building houses along tower Road. The parameters have changed they shouldn’t even consider Tower Road. At the very least the Regina Bypass should be built at Gravel Pit Road. Why would you not build the bypass outside city limits at Gravel Pit Road that can go north and south and according to a stakeholders engineered study, would cost over 100 million dollars less? Who benefits? What influence did the commercial developers who purchased property along Tower Road have in the dysfunctional, dead end bypass being built near Tower Road? A senior Department Highways engineer said the location of the Bypass at Tower Road was influenced by the developers. How does someone have so much power to influence an absurd decision that will not reduce traffic congestion into the city? Why are people losing their homes and businesses because the Bypass location in city limits is flawed, for the future benefit of the developers? Why is the government building a bypass in city limits the going 3 miles south into farmland, then stealing our land? Is this legal, ethical? Why should we the taxpayers pay for this crazy idea to build a dead end bypass within city limits that will not reduce truck traffic coming into the city? Why don’t the developers, who are benefitting from the bypass that goes beside their property pay for this very costly street? Why couldn’t Flying J Truck Stop get the land along tower Road and Highway #1 developed and approved for a truck stop, when they purchased the land in 2006. They were forced to sell because they couldn’t get approval or services. Then a large developer purchased the property and within a few months the city annexed the property and the bypass was moved 400 meters east of their property. Now there is a proposal for a large mall with a big box store. How does that happen? Who is benefitting? Mayor stakeholders along the Bypass route they say the bypass route is flawed, the bypass should be built outside the city limits. When asked to lobby the government for change, they say we do business with the government, we don’t want to rock the boat. Why is the government, our employee allowed to do whatever they want, for whoever they want, for no good reason? Why are we building a bypass on the south side of the city that cannot go north when the majority of trucks need to go to the north end of the city? Wouldn’t having a Big Mall beside the bypass create more traffic congestion on Victoria Ave with added traffic and lights? The government is stealing our property, homes and business future to build a dysfunctional, unsafe, dead end bypass near Tower Road for no good reason except for future profits for all the developers along this route. I am being offered a quarter of the value for my land a fraction of the cost to rebuild my house, it doesn’t make any sense to build a bypass near Tower Road in city limits in the first place. Why is the government low balling land along the bypass route, affecting over 100 properties for a flawed bypass location? Is there a truck stop proposed for the Sask MLA, Christine Tell’s Family land between Tower Road and Gravel Pit Road. How does this happen or is this just politics? Is this a breach of public trust? There should be a public inquiry into who is benefitting from the Regina Bypass that will only divert a fraction of the truck traffic around the city. The majority of the truck traffic is going to have to still come into the city to go to the north truck depots, drop offs and services highway north. Who is benefitting? Why if the government no releasing the functional study to show the science behind the decision to build the Regina Bypass in city limits. If it was such a good idea they should be eager to share the information with the taxpayers who are paying 1.2 billion dollars for this bypass that is supposed to serve the community for 50 years. Who is really benefitting? The Alberta Ministry of Highways said that the Functional Study for the Edmonton Anthony Henday Bypass was released to the public before the project went to tender to ensure the public was informed, so that there was transparency and clarity. If the public hand any concerns then they could come forward and the Department of Highways could deal with it. Why isn’t the Sask Department of Highways releasing the Functional Study only a highly redacted version is there something to hide? Why should taxpayers have to pay 1.2 billion dollars in city limits that cannot go north that will reroute only 10% of the truck traffic south around the city and not reduce truck traffic coming into the city? Who benefits? Why is the government not being transparent to the public, the ratepayers who are paying over 1.2 billion dollars for the Bypass? Is there something to hide? How does the Bypass go north from Tower Road to move truck traffic to truck terminals and highways in the North Regina? What are they crazy? Why would they put a Highway Bypass inside of the city? Someone must be getting rich off this. This Bypass location in the city limits at Tower Road doesn’t make any sense. Is there a new mall going up on the corner of Tower Road and #1 Bypass? Who is building the mall? Why was the Bypass moved 400 meters east of Tower Road? So that’s why the developers pushed the original Bypass Route off Tower road. The mall developers would have lost 40 to 60 acres of land now they lose about 5 acres. How much more will it cost to build the bypass by moving it 400 meters east of Tower Road that resulted in the bypass interchange with high speed curves over top of railroad tracks? How many oil tankers pass under the bypass daily? Isn’t this an unnecessary risk? How much is the interchange at Tower Road going to cost compared to a normal interchange? Why would we build a bypass with high speed curves over top of railroad tracks 30 feet in the air when moving it 1.5 miles outside the city would make it a normal interchange and cost much less? The bypass at Tower Road is a scam – taxpayers are the victims. Just follow the money to see who is behind this scam. The Regina Highway #1 Bypass at Tower Road is going to be another white elephant like the Stadium. Who Benefits? The public has not been informed about the location and details of the Regina Bypass at Tower Road. Why isn’t the Media reporting the News about the Regina Highway #1 Bypass the biggest infrastructure project in Sask history? Who is heading up Media control across the province so taxpayers aren’t informed about the real story about the Regina Highway #1 Bypass? Who has so much power to control the media? There are power plays going on politically. Who is really in control? People should know that political agendas have overtaken the world. Who benefit? The principal of business is that 3% of the people control 97% of the wealth. Why do the 97% of the ratepayers pay for the benefits of the commercial developers from having a Bypass at Tower Road to deliver traffic to the malls and commercial businesses on this road? We didn’t know there was a new mall proposed off Tower Road. So that is what’s driving this agenda. Who will benefit? Does Regina need another mall? 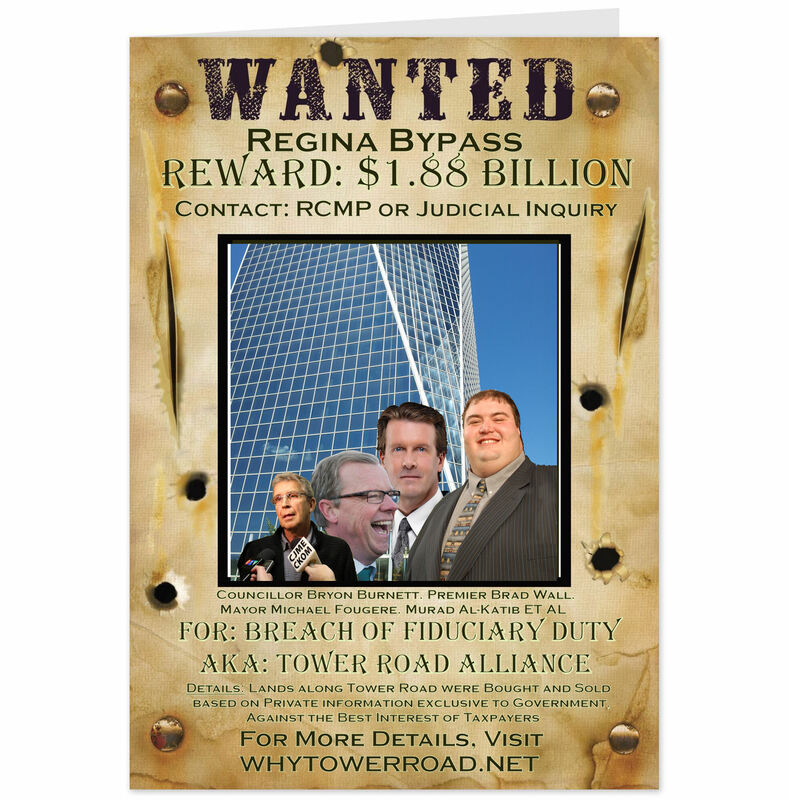 Why isn’t the media reporting the real story about the Regina Highway #1Bypass? Who runs the media in the province? Why doesn’t John Gormley have the biggest infrastructure story on the John Gormley Show? Is there a gag order in the media? The public needs to be informed so they know what they are paying over 1.2 billion dollars for a dysfunctional, unsafe, costly, dead end bypass in the city limits. Why would we build a diverging diamond interchange that was never built in Canada, was rejected in Ontario and is considered complex and unsafe in the US cities it has been built in? Why couldn’t the bypass be built on highway 46 from Balgonie? The infrastructure is already in place. It would save 400 to 500 million dollars and most truckers would use it. Why is the bypass in the city at Tower Road into barren farmland that will never for 50 to 100 years. Why are people losing their farm land and homes for no good reason? Why are we paying over 1.2 billion dollars for a bypass in city limits that is outdated and dysfunctional that cannot go north because of 2 businesses in the way. Who is responsible for this irresponsible absurd decision? Who is benefitting?